Please add your stand with the orb or heart, not here. 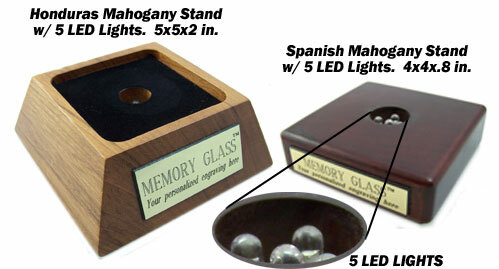 We create each LED Lighted stand by hand at Memory Glass. Hand cut from Honduran Mahongany, and finished with the highest quality varnish available. Finished with black velvet and a cluster of LED lights to light up your Memory Glass Orb or Heart, a stand truly accompanies each piece perfectly.